Meghan Collison is surrounded by plush toys and stuffed animals on the cover of Numero China's #44 issue for November 2014. It's one thing to have hobbies, but a full-grown woman with a stuffed animal collection is pretty unsettling. Perhaps that's kind of the point behind this cover, which features Collison giving the camera a disquieting stare, almost as if daring us to judge her. Or, on the other hand, it could be a matter of encouraging adults to embrace their inner child? Collison wears a luxurious fur coat accessorized with a candy necklace to drive the point home. Hey, some of us just don't ever want to grow up. 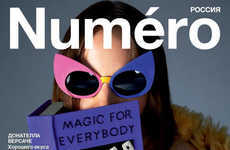 The editorial was lensed by photographic duo Sofia Sanchez and Mauro Mongiello.